We sailed in the early hours of this morning so I woke to find the most beautiful landscape of the Rhine. The weather was warm sunny with a cloudless sky so I went on the sun deck and sat in a very comfortable soft chair and enjoyed the scenery, as the MS AmaDante went through a couple of locks - the engineering that goes into them is amazing! Lunch was a very tasty - vegetable broth and I my entrée was veal that was so tender it just melted in my mouth served in a wonderful creamy sauce. After lunch we all boarded the coaches and met our excellent guide Petra for our trip through the Black Forest. 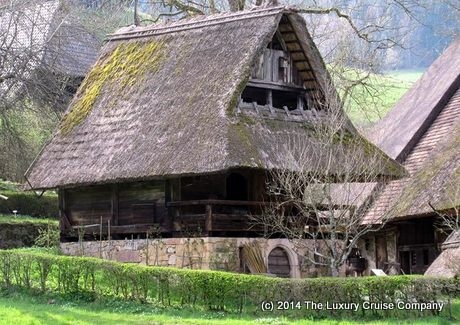 We went to Vosgtsbauermhof Open Air Museum which shows how the Black Forest farmers used to live and they had six complete farmhouses dating from 16th to 19th century for us to explore; interestingly the last resident was still living in one house until 1965. We saw the mill-house, kitchens, living areas and bedrooms - the houses also had stables within them for the livestock. The museum carries out research projects and looks into the cultural heritage of the area. We continued to Triberg, where Germany’s highest waterfall can be found, and the town also houses the world’s biggest cuckoo clock! We had free time here to explore. Back on the AmaDante for our final dinner and we were in the speciality restaurant Erlebnis. You can dine in there once a week and I recommend you book your table for this exquisite evening. Head waiter Geirgi looked after us in 5* style and yet again my gluten free offering exceeded my expectations. It seats just 24 people and the food was delicious.